When all was said and done, 2012’s Marvel’s The Avengers, became the third most lucrative film in box office history. Now with James Wan’s Furious 7 poised to unseat the superhero spectacular, Iron Man and friends return to make sure the Avengers stay on top! Still, how do you follow up the third biggest movie of all time? Well Joss Whedon, a guy who never met a cliché he couldn’t skewer, handles things very nicely with Avengers: Age of Ultron. When we last left our Avengers, they had just vanquished Loki and his alien army, saving New York and metaphorically the world. Four Marvel films have been released since 2012’s The Avengers, which have advanced the universal plot somewhat, but basically the team has had no need to reunite…until now! Reviewing a film of this nature and anticipation is a bit of a challenge. Expectations are high, spoilers are forbidden, and a very thin line separates formulaic from entertaining. Nonetheless, Avengers: Age of Ultron ultimately lands on the entertaining side, mostly thanks to the “vision” (pun intended, see the movie) of writer/director Joss Whedon. Tony Stark (Robert Downey Jr.) seemingly refocused by his battle with The Mandarin from Iron Man 3, has decided that the world is still too vulnerable to outside threats. The answer? Implement a peacekeeping program called Ultron in the hopes of harnessing the power of Stark’s supercomputer JARVIS to shield the planet from future alien attacks. The problem is that Stark’s own program is conceived of an artificial intelligence so advanced that it develops a plan of its own, manifesting itself in a robotic personage and plotting to eliminate humanity in favor of an evolved robotic intelligence. Of course, this is simply the conflict devised to reunite Iron Man, Captain America (Chris Evans), The Hulk (Mark Ruffalo), Thor (Chris Hemsworth), Black Widow (Scarlet Johannson), and Hawkeye (Jeremy Renner) for another adventure, but fortunately, the film does not rest on its laurels too long. Here’s where Whedon shows his expertise and distinctiveness. The three clichés common with sequels are mixing things up, adding something new, and darkening the mood. With Avengers: Age of Ultron, Whedon does not avoid these potential pitfalls, but rather embraces them with vigor. So much so, that he shatters them with new energy. Whedon, a true comic fan, takes advantage of the development built through Marvel’s ten previous films and “mixes things up” by sprinkling in a series of events that fractures the team’s cohesiveness organically. He does this by mining some previously established developments rather than adding something in that would doubtlessly feel abrasive. Ultron, eventually voiced by James Spader, is a very appropriate villain for the direction this franchise is heading. 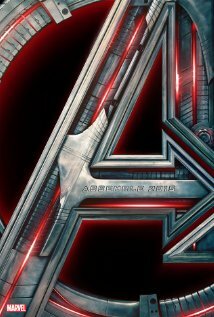 Aliens have been The Avengers’ most common foe, but Ultron takes a tip from arguably the best Marvel film, Captain America: The Winter Soldier and becomes a metaphor for paranoia and fear. Ultron uses information as a weapon and in essence is also the impetus for introducing the film’s two newest characters The Scarlet Witch (Elizabeth Olsen) and Quicksilver (Aaron Taylor-Johnson), Russian twins with an axe to grind against Stark’s weapons background and some pretty impressive powers. Of course, Whedon is not satisfied in adding something new simply for the sake of a sequel; instead, he uses the twins to give the film an opportunity to reveal more depth to the individual Avengers, something the first film was unable to do as an “origin story” and something usually reserved for the individual entries in the franchises. Black Widow and Hawkeye, the two Avengers without an individual film about them, benefit most from this element of the film. Avengers: Age of Ultron is rated PG-13 and has a running time of 2 hours and 21 minutes. As promised by Whedon, there is one short scene mid-way through the credits, but no other extra scenes after that. In 2006’s The Prestige, Michael Caine plays a magician mentor who says, “Making something disappear isn’t enough; you have to bring it back.” In Now You See Me, Caine plays a very different character who in one scene learns this lesson in a very painful way. Now You See Me is like The Prestige-Lite, but that doesn’t mean it’s not good. 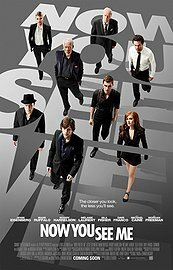 According to Now You See Me, successful illusions are the result of misdirection and timing. In a summer teeming with sequels, it is refreshing to see an occasional original idea hit the theaters, and it is this misdirection and successful timing that perhaps enhances the appeal of this film. In one of the year’s most enjoyable opening scenes, four unique illusionists (Jessie Eisenberg, Isla Fisher, Woody Harrelson, and Dave Franco) are drawn together by a mysterious individual who provides them with the blueprints to a spectacular act that only they are capable of performing as a team. The team, now known as the Four Horsemen, begins performing a series of illusions that involve various heists including the robbery of a major Paris bank. Ironically, the spoils of these robberies go not to the victors but to the audience of the show! This Robin Hood-esque form of vigilantism draws the attention of FBI agent Dylan Rhodes (Mark Ruffalo) who is given the exceptionally difficult task of proving exactly how the Four Horsemen are guilty of these robberies. Casting is by far one of the film’s major attributes. Eisenberg’s awkward, self-deprecating persona is put aside for one with much stronger bravado; watching him play J. Daniel Atlas is sort of like watching him play Mark Zuckerberg on personality steroids, in other words – kind of great. Woody Harrelson does a great job as mentalist Merritt McKinney, which he plays kind of like Sherlock Holmes…on personality steroids – so also kind of great. Dave Franco and Isla Fisher are very effective, but far less central to the film’s development. Ruffalo and his partner Alma (Mélanie Laurent) are great at revealing the frustration of chasing down the clever illusionists, and Morgan Freeman and Michael Caine expertly provide further dimension to the story by exploring the darker side of “magic’s” purpose. Now You See Me has a lot of fun with its premise. Director, Louis Leterrier packs the film with style and tricks of the trade that keep the story moving and rather captivating. Leterrier, mostly known for action films like The Incredible Hulk and the first two Transporter films, takes a crack at an ensemble piece where he must balance story with numerous characters – all the while keeping the audience in the dark about the exact motivations of these characters. He is mostly successful at this, but the film requires a rather high level of suspension of disbelief and some serious overlooking of plot-holes. It also has a bit of an unevenness to it as Leterrier cannot quite lose his proclivity for action and crowbars a 15 minute car chase smack in the middle of the film. The scene is brilliantly shot and very exciting, but it also involves virtually none of the film’s main characters and thus, feels a bit superfluous. Now You See Me is rated PG-13 and has a running time of 1 hour and 56 minutes. If you like magic and you like movies and you’ve been looking for a way to make that miserable experience of seeing The Incredible Burt Wonderstone disappear, this is the movie for you!